Judge Ashton Skippers has ordered the SABC board to serve Motsoaneng with charges within 14 days and launch a disciplinary process to be completed within 60 calendar days and an independent person should preside over proceedings. The judge has also ruled that Motsoaneng should be suspended with full pay, pending the outcome of this process. (On charges he must face) for lying about his qualifications, for purging senior staff members at the SABC, for improper conduct in appointment and salary increases, as well as abuse of power. I’m still the COO of the SABC and I’m happy because this is a process that we are following and I respect the courts of this country but I believe that another court will find it in a different way. I still believe that I have never misled the SABC, so I’m happy and I’ve instructed my lawyers to appeal with immediate effect. We respect the judiciary and presiding judge, however my instructions are to bring an immediate application for leave to appeal. We’re currently busy with filing papers at the moment. If we don’t file by this afternoon, we’ll definitely file on Monday morning. The effect thereof would be to immediately suspend the execution of the current judgement. He (Motsoeneng) is suspended pending the finalisation of the disciplinary proceedings, but the commencement of those disciplinary proceedings will be only upon him receiving the charge sheet from his employer. He (Judge Skippers) gave the employer – that is the SABC – 14 days from today to serve him with the charge sheet. So if he (Motsoeneng) were to receive the charge sheet today, notionally, he would be suspended from today. If he were to receive it on day 12, then his suspension would kick in on that day. But that we are hoping that will become academic as soon as we serve our application for leave to appeal. I think he’s being economical with his interpretation. The judge said that while the Public Protector’s findings are not binding to an organ of state, they cannot be equally ignored. 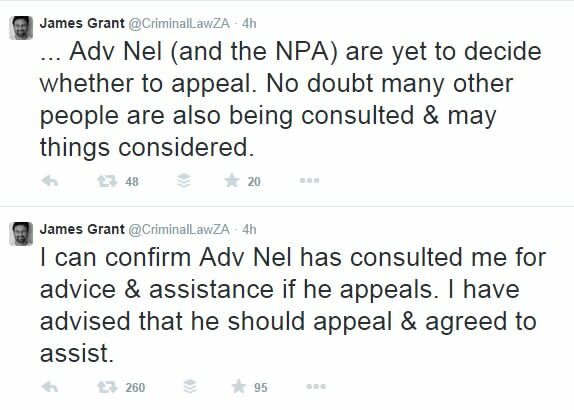 This means you have to implement the Public Protector’s findings unless you find compelling reasons not to, in court. It (the BDP) won the last elections in 2009 – of the 63 seats, it holds 45, it holds a vast majority. But for the first time, the Botswana Congress Party – this umbrella for democratic change – have remained cohesive. The new Botswana Movement for Democracy – a break away from the ruling party – that’s made itself known. I don’t think Ian Khama is going to lose the election, he’ll get his second mandate, but he’s got his work cut out for him. The impact for the opposition has been in the urban seats. He (Nel) just asked what my thinking was on the judgement by Judge Masipa and whether I thought it was worthwhile him appealing. I do believe Judge Masipa made several errors in her judgement in result of that, he should appeal. This was a stinging attack. She said that Mujuru was incompetent, she survives on extortion. And then in response to people saying she (Grace Mugabe) in fact wants to be President, she said ‘Why not? Aren’t I a Zimbabwean?’, which is probably going as far as putting herself up as her husband’s successor.